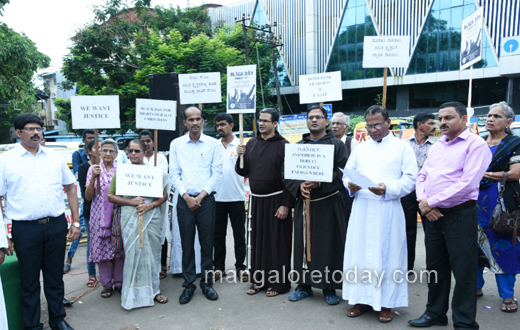 Mangaluru, August 10, 2017: Mangalore Diocesan Pastoral Parishad’s Social and Media Committee, held a rally front of D.K. D.C.s office today August 10, Thursday afternoon demanding repeal of Constitutional Order 1950(Scheduled Caste) to include Dalit Christians also in the Scheduled Caste and extend due benefits that they have been denied for 67 years. 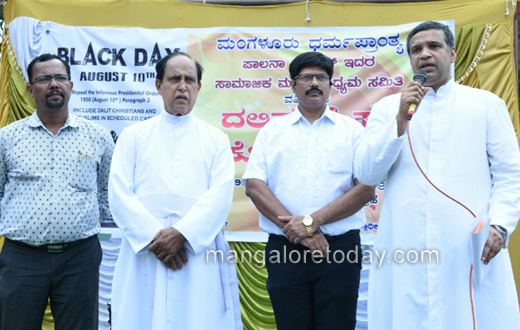 The Catholic Bishop’s Conference (CBCI) of India, New Delhi office for SC/BC observes August 10th as ‘BLACK DAY’ to protest against the unjust Constitutional Order 1950 which excludes Dalit Christians from the SC list on the basis of religion. It can be recalled that the Constitutional Order 1950(Scheduled Caste) was amended in 1956 to include the Sikhs and in 1990 to include the Buddhists. 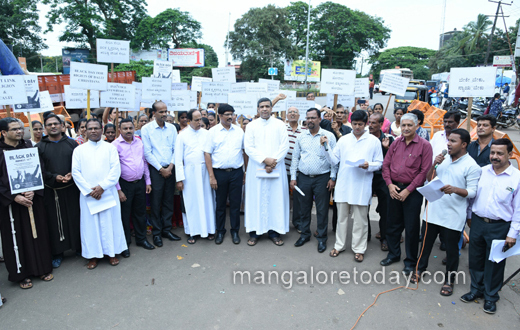 Msgr Denis Moras Prabhu the Vicar General of the diocese of Mangalore in his message urged that the Central Government of India to take up the issue as early as possible and do justice to the Christians and Muslims now excluded and deprived of their due rights for the last seven decades. Dr Vincent Alva, the Principal of St Mary’s degree College Milagres Kallianpur said, "When other SC & BC get benefits excluding Christians and Muslims is very unjust. The question of exclusion of these two convert groups all over India on from the SC list is the reason that August 10th is observed as BLACK DAY. The then President of India Babu Rajendra Prasad signed the Constitution Order on August 10, 1950 and persons coming under SC category became entitled to certain facilities which the SC Christians are deprived of because of their faith conversion. Hence it is our demand that they too should be included in this category. The SC facilities are extended to the Sikh and Buddhist communities but Christians and Muslims are kept out from this privilege. Is it not injustice most glaring? ", he asked. Adv. 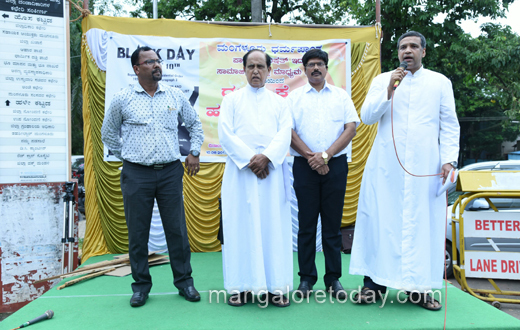 M. P. Noronha leading lawyer and the Secretary of Diocesan Pastoral Parishad said that exclusion of Dalit Christians in the SC list is violation of Article 14, 15, 19 and 25. When the Scheduled Tribe don’t lose their status when religion is changed why the Scheduled Castes should be denied the same. The Constitution Order 1950 is amended in 1990 to include the converts to Buddhism. Hence it is injustice to deny this privilege to the Dalits who embrace Christianity. According to Article 14 all Indians are equal. If that is so why there is discrimination when it comes to Dalit Christians? If is injustice to deny privileges just because one changes the faith. We hear a lot about Uniform Civil Code. Now is the opportune time for the Government to treat all Dalits with over due equally irrespective of their faith. The Ranganathan commission too had recommended this decades ago but the report is in cold storage. The case filed in the Supreme court of India too has not been taken up for long. 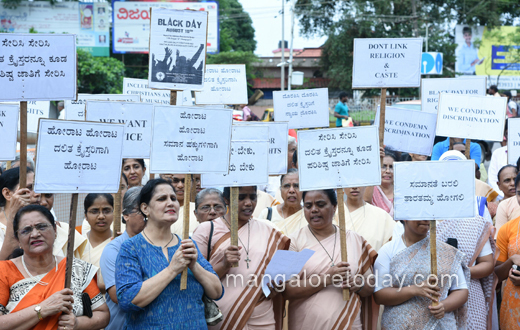 Hence the Government should amend the faulty and unjust order to include Dalit Christians and all Dalits without discrimination. A memorandum was being presented to the concerned authorities. 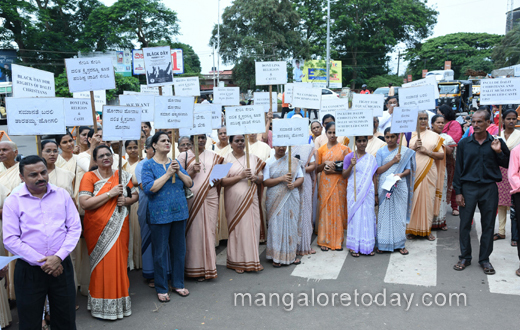 The rally was well attended by members of the public, nuns, priests who solemnly expressed their stand.